Blood or Whiskey - Celtic punk from Ireland, The Dubliners meets The Clash! We hit Toners on Baggott Street, on May 27th for an afternooner. March 9th, We're off to Czechoslovakia!! Prague will have the biggest St Patrickâ€™s Day celebration ever on Saturday, March 17. Locations throughout the city will embrace Irish culture and friendship. For the first time, there will be a parade from HybernskÃ¡ Street around the city center through Old Town Square, Narodni trida and Wenceslas Square and back to Hybernska Street. It is a fitting location as Hibernia is the Latin name for Ireland. And in May we return to Toners on Baggott Street. February 5th, Salty Dog Cruise getting close!! The #SaltyDogCruise is back April 20-23, 2018 for another adventure on the open seas aboard the Norwegian Sky with Flogging Molly, The Offspring, Buzzcocks, TheAdolescents, Mad Caddies, The Bunny Gang, Skinny Lister, Punk Rock Karaoke, Blood or Whiskey, Broilers, Beans on Toast and MORE! October 26th, Rebellion Dublin TOMORROW NIGHT! October 4th, Rebellion Dublin SOLD OUT! September 12th, Thanks Flogging Molly! Thanks to Floggy Molly and their crew for a couple geat nights in Dublin and Belfast. August 29th, We're playing Salty Dog Cruise! August 29th, We're playing with Flogging Molly! We're delighted to playing with good friends Flogging Molly this September in Dublin and Belfast. April 4th, Rebellion Dublin SOLD OUT! March 30th, Back home, what a tour! Back in Ireland following our 26 date tour of the East coast of the U.S. with The Interrupters and Dropkick Murphys!!! Well what a tour that was, we played some of the best shows of our career (26 shows in 30 days) and to the greatest of people, thank you for turning out early to catch Blood or Whiskey! None of this could have happened if it wasn't for the Dropkick Murphys and we want to thank each and every one of the DKM band and the crew for giving us this opportunity again, you are truly top people and it is an absolute pleasure to work with each and every one of you, THANK YOU! On this tour we had the pleasure of sharing the stage with our amazing new friends The Interrupters, what a band, they nailed it every night without fail and were an absolute pleasure to be around, so thank you all so much for everything along the way! It was brilliant to see all the great charity workers on a daily basis, who became friends, to see the great efforts that they make for both The Claddagh Fund and the Love Hope Strength Foundation. You are all truly amazing people doing great and very important work! We met some new and some old friends and family along the way. Lenny Lashley as always a gent and fair play for lending us the speaker and thanks to Brendan Jelloe for sorting that out for us and of course all the great pictures and videos during the tour, It was great to catch up with Phil Cadaver (The BlameNYC), Frank Visone , Joe Trojan and Ciaran McCabe in New York City when we played our own show with support from our good friends The Blame, at Webster Hall. On this night we were joined on stage by our very good friend Cait O'Riordan who brought the house down with a fantastic version of "I'm a Man You Don't Meet Every Day", it will never get dull playing this tune with Cait. We were then joined on stage by our host from Staten Island Phil Cadaver and Paul, for our version of their band The Blames' classic track "Streets of New York", I hope we did it justice lads. Finally we want to thank all involved with Blood or Whiskey, touring can really take its toll when you are doing 26 shows back to back, great job lads enjoy the rest; Dugs, Chris, Kev, Baz, Sully & Robbie also to Vinny on merch and Frank in the office, super effort all round lads. As always it is an honor, a privilege and a pleasure, to get the opportunity to bring our music to the U.S. and we hope to see you all out there again real soon. To our Irish and maybe some of our European friends and fans see you in Toners, Dublin on April 23rd. We start our tour with Dropkick Murphy's and The Interrupters on Feb 21, we look forward to seeing you all on the road! December 23rd, Happy Christmas & New Years to you all! Thanks to everyne that came out to the Grand Social last week. Happy Christmas & New Years to you all, lookihg forward to be on the road across the US in new year, see you on the road. We are pleased to announce that we will be headlining our own Christmas Show at The Grand Social right here in Dublin on Friday 16th December 2016. We have our good friends and very special guests The LEE Harveys supporting us on what is going to be an epic night. We're delighted to be back on the road with Dropkick Murphy's and The Interrupters in 2017. Its getting close! See you all on the road! Thanks to eeryone for the great time we had at the Irish Festival and everyone else on the rest of our trip. Sept 8th, USA WE'RE COMING! Not long now til we're in Boston playing with Dropkick Murphy's, James Fearnley of The Pogues, a few more and a number of boxing bouts including the great Spike O'Sullivan V Mark Deluca. Aug 9th, Dropkick Murphy's and a boxing match! We're delighted to say we'll be playing the Irish Festival - a day of music and boxing! Dropkick Murphy's, James Fearnley of The Pogues, a few more and a number of boxing bouts including the great Spike O'Sullivan V Mark Deluca. Top weekend, thank you Edinburgh - especially Jason Gibby Gibson and all our old mates there! An to Debbo Rsab Jacobs, Chris Brown and all the crew, and The Lagan for an unplanned / unrehearsed version of Shipping up to Boston at Rockstock! Our next gig is in Dublin on June 11th in Fibbers - a double headliner with Paranoid Visions! This weekend we are off to Edinburgh and Willington (1st April - Bannermans, Edinburgh 2nd April - Rockstock, UK), come on down! What a night!! A huge thank you to Cait O'Riordan, Trouble Pilgrims, Eddie and Marie Confrey, Damien O 'Meara, Robert Collins, Beano, Frank Cronin, John Foley, Vinny Blake, Philip Harrison, Carl, James and Eugene from the Workman's Club and lastly to everyone that showed up to the Show last night thank you. It was all for a great cause, The Irish Heart Foundation in memory of Alan Confrey and the 100th anniversary celebrations of the Easter rising for our great nation. See you all tonight, it's going to be a great night of celebration for Alan Confrey, The Irish Heart Foundation and the 100th anniversary of our great nation. 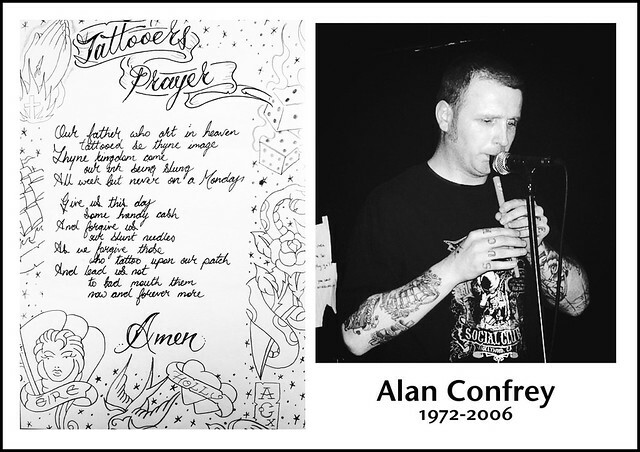 Remembering Alan Confrey on the 10th anniversary of his passing on this day in 2006. We are thinking of you and your family on this and everyday. Saturday's gig at the Workman's is dedicated to you brother! Rest In Peace. * Thanks to the 3 amazing crowds in Italy for St Patrick's week, we had a blast! * The competition to win tickets for the Easter Rising show on March 26th in Dublin closes this Wednesday, be warned tickets are moving fast! May 27th - Toners, Baggott St.